All of the DXair systems built today are part of our RRS series. These pool dehumidifiers (LV/EC/MC Series; the SS Series can also utilize secondary coolant technology) are liquid cooled packaged dehumidification systems that are factory charged and sealed, eliminating onsite refrigeration work. 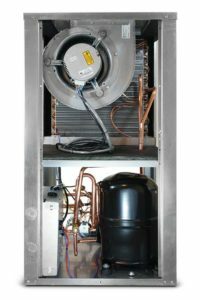 The refrigeration circuit uses glycol and water as a heat rejection transfer fluid to an outdoor fluid cooler or cooling tower. Our efforts to reduce refrigerant and become environmentally responsible offers key advantages. These are true green machines and use approximately 80% less refrigerant the conventional DX systems with outdoor remote condensers. There is practically no limit to the distance the outdoor remote fluid cooler can be located from the building, non-invasive, no breaking into refrigeration lines to service, and is used in “Green” or Leed Certified applications. Copper piping is not required; water grade plastic/PVC is appropriate. Our fluid cooler/dry cooler applications use the least amount of refrigerant in any packaged dehumidification system. We do not compromise your air flow delivery system! This option is exclusive and standard on all DXair pool dehumidification systems. 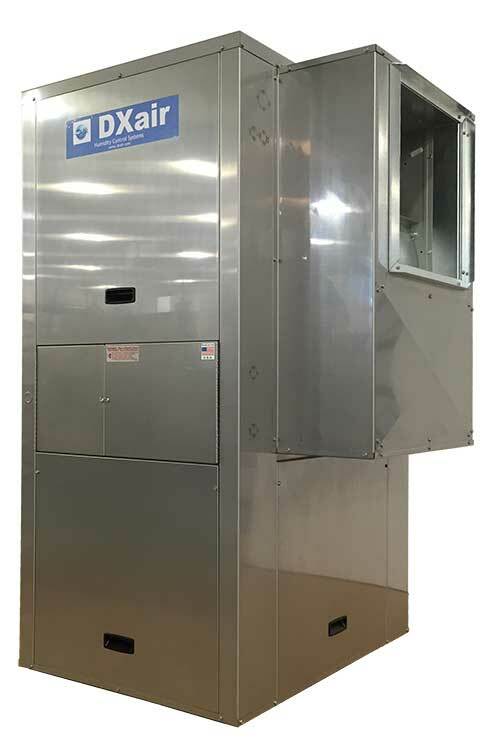 With Max-Evap, all DXair moisture removing capacities are maximized regardless of entering dry bulb or wet bulb temperature while maintaining 100% of the systems air flow to the space. Veri-Dry, LLC builds a complete line of pool dehumidifiers for a variety of commercial natatoriums, residential indoor pools, hotels, resorts, physical therapy/rehab, schools, YMCA’™s, athletic facilities and more. These systems provide standard as well as many new innovative features and advantages in each system. A variety of dehumidifier configurations are offered based on your natatorium design. The LV/EC/MC Series are built in the USA, in R410A, in an ISO Rated Facility. These units are ETL Intertek Listed (conforms to UL1995 standards), CAN/CSA Certified. Platforms available: air cooled, water cooled, building loop, cooling tower and no cooling. LV Series – This series is our standard ½-6 Ton Single Compressor “Quiet Package” pool dehumidifiers in vertical, horizontal and counter flow options. EC Series – This series is our standard 6-30 Ton Dual Compressor “Quiet Package” pool dehumidifiers in vertical, horizontal and counter flow options. This series has additional options for take apart construction and larger blower packages to accommodate higher cfm for larger natatoriums. MC Series – This series is our standard 30-60 Ton Modular “Quiet Package” pool dehumidifier units built in a “low” or “high” design. Configurations vary, and custom options vary with take apart construction, larger blower packages. The MC Series comes standard with Bronze Glow Coated option. This series is currently built in 2-20 tons in a High Grade 304 Stainless Steel Cabinetry with all internal air coils Electro-Fin Coated. The pool water condenser for pool heating/heat recovery is built into the unit. These are single compressor units in R410A, and ETL Listed. The geothermal pool dehumidification systems feature the only NON-REVERSING Heat/Cool/Dehumidification system with 100% hot gas reheat and pool heat recovery in one very compact packaged unit. This very unique and innovative line has eliminated a major problem that has plagued the industry for decades. The packaged heat reclaim dehumidification unit comes standard with compressor, evaporator, 100% hot gas reheat condenser, liquid to refrigerant shell and tube condenser/evaporator, Max-Evap option and air handler. Platforms available: Air cooled (using fluid cooler or outdoor dx condenser), water cooled, cooling tower, building loop and specifically built as a geothermal open or closed loop pool dehumidifier.